Sunday’s weather had been forecast as fine but Saturday was dreadful making me a bit nervous. However, when we met at Sidings there was a nip in the air but it was dry and clear. Seven set off from Sidings: Jiten and Michael, Morten and Oliver, Caspar and Eve, and myself, of course. John was also leading a group from the Hampstead Heath tennis courts so he had to start half an hour earlier (which I usually have to do for rides in his direction). 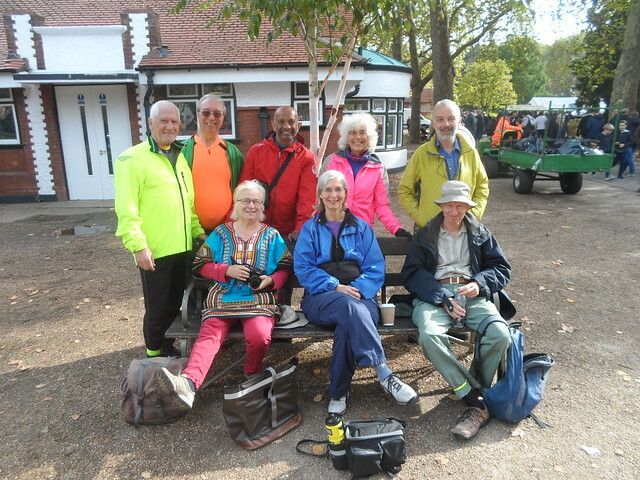 We’d arranged to meet John’s group at the Greville Road/Greville Place Junction in South Hampstead. There was John and Ellen, Chris and Barbara and Jenny also joined us there. 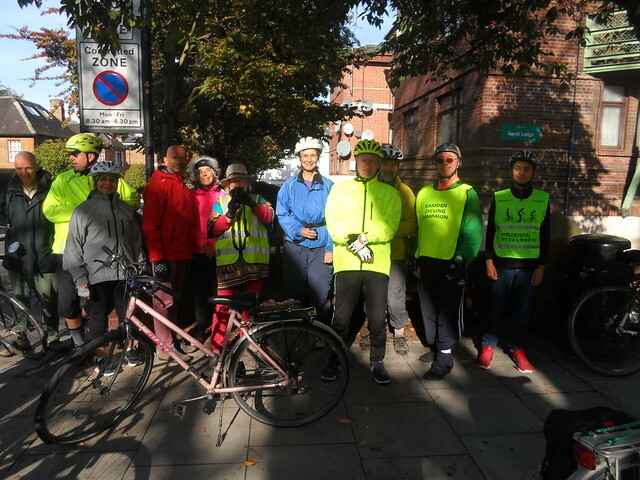 We all continued on to Fulham across Maida Vale, through Westbourne Park, Notting Hill, Holland Park, West Kensington, Barons Court, and into Fulham and Bishops Park arriving at about 11:20. 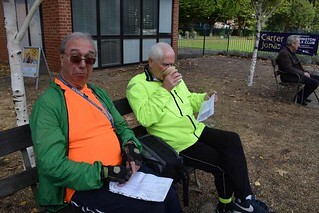 The group’s unanimous decision was to have a cup of tea or coffee in the cafe and then to split up and visit the palace and meet up again at the bikes at 2pm. 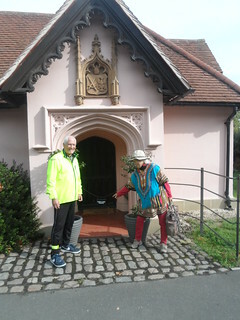 After refreshments we went into Fulham Palace in smaller groups. There seemed to be a lot of rooms that I’d missed before. 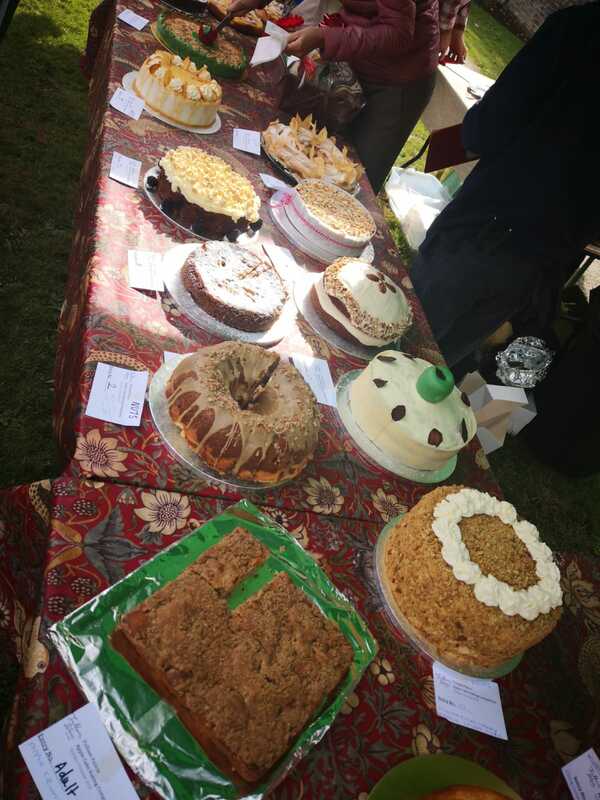 I expect that, as that Sunday was a special occasion, there were more exhibits showing. One was a large exhibition about the first world war. It was all very interesting. 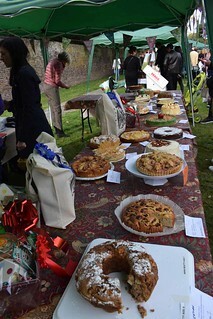 In the walled garden was the Apple Celebration. It was a big festival with many stalls with musicians playing folk, selling cheeses, cakes, preserves, drinks and an apple cake competition. Had a taste of a Spiced Plum Pavlova which was moreish. 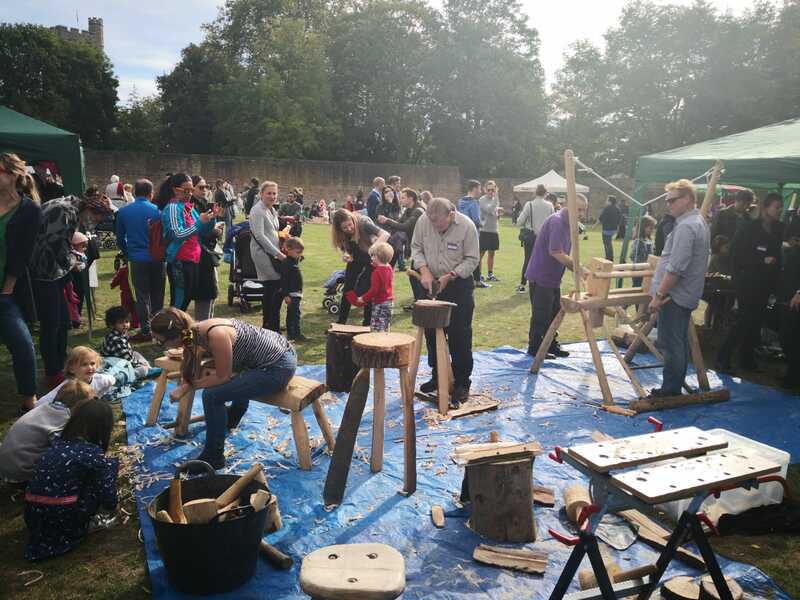 We walked though the garden, past All Saints Church and up to the River Thames near Putney Bridge to view the place where the University Boat Race starts, and then back to the area where there were street-food stalls. We took advantage of the various types of food offered and were in time to meet the others back at the café for another coffee. Morten and Oliver had texted to say they would make their own way home. Caspar and Eve headed off towards Chiswick to see a relative. The rest of us waited for the Fulham and Arsenal supporters to leave. They told us that Arsenal had won 5-1. Shame! I used to be a Fulham supporter when I lived there. When it seemed mostly clear we set off towards Hammersmith. I would normally have cycled along by the river but there are No Cycling signs so we took the route the other side of the park. 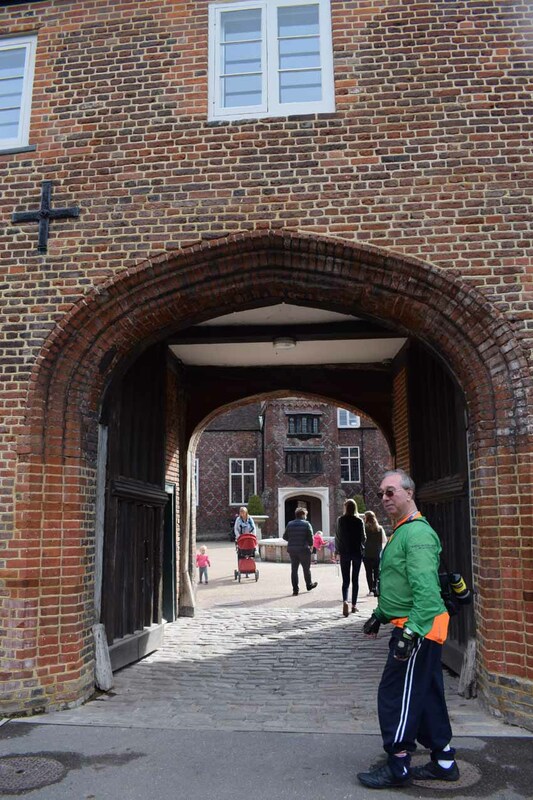 Unfortunately the road in front of the football ground entrances were still packed so we diverted away from the ground then along parallel roads for the length of the ground and back again so we could join the Thames pathway. 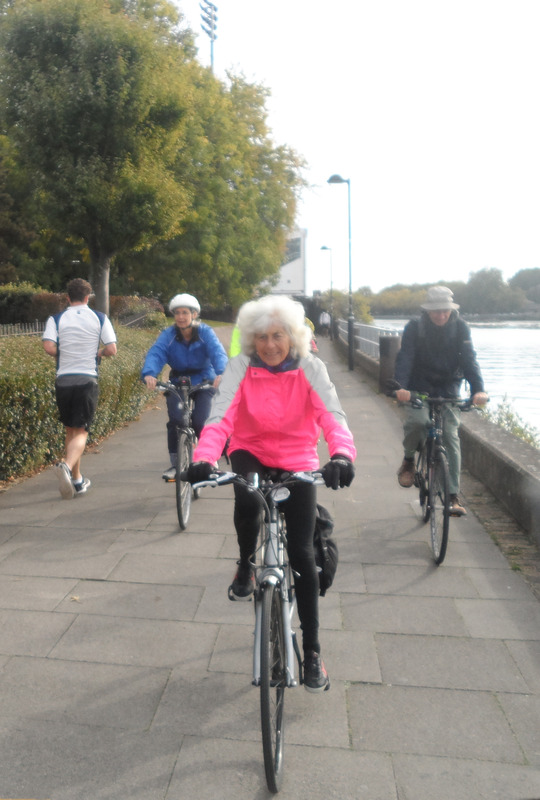 Everyone was enthusiastic about the ride along the river despite having to go very slowly as there were many pedestrians enjoying a lovely sunny riverside walk (or run). The pathway took us under Hammersmith Bridge where we rejoined the roadway using the cycling crossings over the Great West Road. We were just getting away from Hammersmith when one of the bikes developed a problem with the brakes. 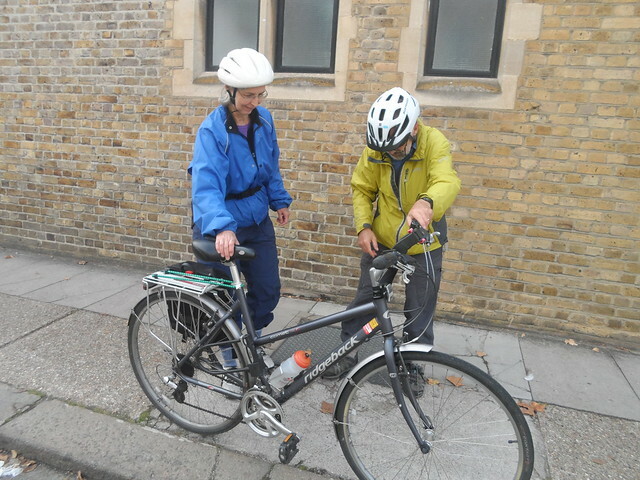 Fortunately John, who is one of our Doctor Bike mechanics soon solved the problem and got us all moving again. Soon after we we crossing the Shepherds Bush Road and picked up our original route. 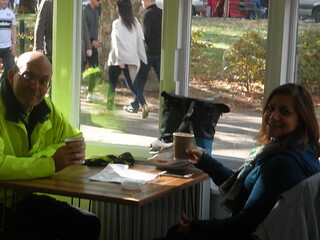 We almost retraced our steps back through Notting Hill and Holland Park to Westbourne Park. As we were back earlier than planned I suggested a stop at Paddington Recreation Ground to see the plaques dedicated to Randolph Churchill (Winston’s dad, who put a lot of money into creating the place), Roger Bannister who ran a sub-four-minute-mile in 1954, and Bradley Wiggins who won the Tour de France and and Olympic Gold Medal in 2012. We all agreed to stop and we all had another coffee. We all started to separate there. 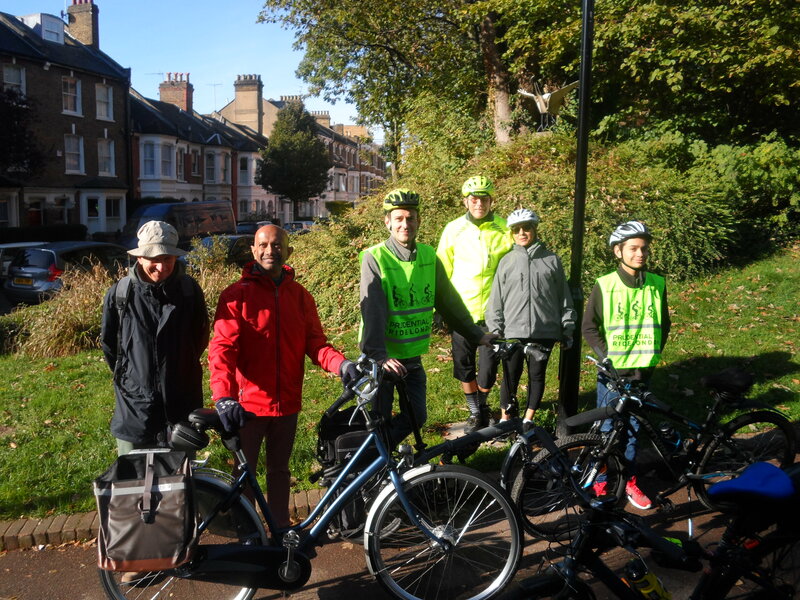 Michael turned left out of the park, Jenny and Jiten went up the Edgware Road and the rest of us crossed into Carlton Vale. We said goodbye at the junction where we met earlier. They all said they’d really enjoyed the ride. Sadly I had no-one to accompany me back to Sidings.